MATcutter.com has archival foam core and archival cotton rag backs! Archival Back Choices Are Diverse. You have multiple choices even in archival mats. Make it simple, match the backing materials to the mat material you will use. In other words, if you are buying PRESERVATION grade mats, use either actual cotton raq backs or our cotton covered archival foam core. If you are using CONSERVATION grade materials, you can use backs that are ,made of alpha-cellulose. Our value line backs will do just fine. Or, order, archival foam core with archival paper face material. Your can use cardboard if you wish. No one will notice, at first. Deterioration will occur and you won't see either at first. But it will be there. Click on image to select mat sizes and colors. Cotton is the conservationists choice for both mats and backs. Create a total acid free, cotton environment for your art. Because cotton is naturally acid and lignin free, cotton rag for both mat and back is traditional. It is also useful when doing archival framing and archival cotton foam core is too thick to fit in the rabbet of the frame. Cotton rag backs are approximately .060 thick, about 1/16 inch. They will help preserve your artwork for many decades when combined with cotton rag mats and archival framing techniques. First, cotton rag is the pinnacle of framing materials used by museums, galleries and artists for centuries. Naturally acid-free and lignin free, cotton is a superb archival backing. However, there are some conservationists that say some photographic prints, especially some older processes like albumen, chromogenic, dye transfer and cyanotype should be framed in a "low alkaline enivironment". Some say this applies to modern photographic processes and even ink jets prints, often called giclees in the art market. There are diverse opinions that are beyond my depth of knowledge. Regardless, buffered or unbuffered, cotton rag is the best mat and back. 4 ply rag, approximately .060 thick, in white. You can now get the quality and preservation characteristics of traditional cotton backs in a modern, foam core product. 1/8 inch foam core with truely archival foam and archival cotton rag facing papers on both sides. Preservation and rigidity as well as resistance to warping caused by changing environments. Cotton covering is buffered. Our biggest sellers are foam core and cotton rag mats. This combinaton works great when showing your work in our super clear bags. The foam core provides the rigidity needed when not using a picture frame. A wonderful traditional adaptation to modern manufacturing. Archival foam core combined with conservation grade face papers that have been treated to emulate cotton rag standards. Available in 1/8 inch thick white or black. 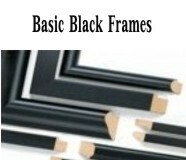 This backing provides a path to more cost efficient archival picture framing. Provides a consistent quality when using our Conservation mats. All of our archival products will preservre and protect your artwork for decades. Foam core 1/8 inch thick and is buffered with calcium carbonate. Quality board that is acid-free and lignin free. 100% virgin alpha cellulose...no recycled materials. Approximately .055 to .060 thick, 4 ply. Backing is buffered with calcium carbonate to resist reacidification. Available in Gallery White with white core. Same material as our Archival Value Mat Conservation line. This back provides archival protection at the lowest price.